An Indian Summer cool morning then bright sunny hot day with a breeze, ahhhh. “Another trip around the sun”. The changing season and the ripe peppers and chard in my garden told me it was time to revisit making spicy yellow split pea dal– I started in my garden and moved to my kitchen sink. Then I considered, how would I like to make this today? I tweaked the spices and used coconut milk given how hot and dry the weather has been– following is my revised recipe today. Cull through then rinse split peas well, cover with 4 cups fresh water, bring to a boil, reduce heat to simmer covered for about 25 minutes, until quite soft. Drain then set aside. Cut thick stems out of rainbow chard. Chop the stems and set aside. Cut the chard leaves into thin ribbons and set aside. In a large soup pot with 1-2 T olive oil over medium heat, add the mustard seeds and allow them to heat up til they just start to pop. Add onions, garlic, and all spices, and stir until onions just begin to turn translucent. Add the chopped yam, stir to coat well with spices, add severak tablespoons of water, reduce heat and cover to simmer until softened, about 4 minutes. Add coconut milk, yellow pepper, celery, and chopped chard stems, cover and simmer another 2-3 minutes. Remove from heat. When split peas are soft, drain their water into a measuring cup to use later. Add split peas to large pot of spiced vegetables, stir to mix all together well, then add the cooking fluid from the split peas to obtain your desired consistency of dal. 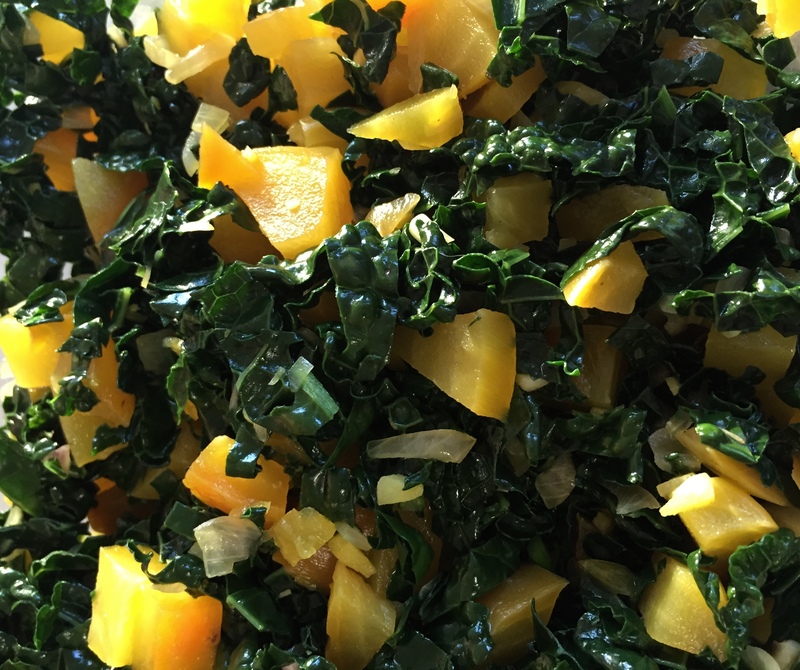 Serve over rainbow chard ribbons, dress with fresh squeezed lemon. Serve in a bowl with Bhutanese red rice for a more substantial meal. I picked up some beautiful baby yellow potatoes at the market, and thought about making a potato salad on a cool wet day. No, not a gloppy mayonnaise heavy, summer potluck dish to be passed over. I wanted to make a dish that would be a full lunch or dinner by itself, something bright and satisfying. I already had a cup of spring peas to be put to use too, and I picked up a leek and yellow pepper. I knew I had all I’d need and want when I spotted some aged clover gouda cheese. Now we’re talking easy comfort food! Having just returned from a lovely spring trip to Paris then Florence, I am enthused by all the incredibly delicious French and Italian food we enjoyed! I’m also eager to see how I could incorporate more of the wonderful ingredients and combinations of flavors in my home cooking. Cull then rinse beans, cover with fresh water and allow to soak for 24 hours. Rinse, cover with fresh water, bring to boil, then simmer uncovered for about 1 1/2-2 hours, until beans are soft. Turn off heat, allow to cool in water. Drain, set aside in casserole dish. Saute garlic for 1 minute in olive oil, then add haricot verts and continue to saute, stirring over medium heat for 2-3 minutes. Add a couple tablespoons of water, cover, reduce heat and simmer until beans are bright green and just slightly softened, about 2-3 minutes. Remove haricot verts to casserole dish. Saute chopped yellow pepper with lemon thyme and basil for about 3 minutes, until bright yellow and slightly soft, add to casserole dish, together with chopped red onion and black olives, stirring all together well. Dress with lemon juice and pulp, a drizzle of olive oil, ground green pepper to taste. Coarsely chop beets in half, then each half into thirds, so pieces are approximately equal in size (so will cook quickly while also still being easy to pare after cooking). Place into saucepan, barely cover with water, bring just to a boil, then reduce heat and simmer covered until soft, about 7-10 minutes. Do not overcook- check frequently with fork for doneness. Drain and rinse in cold water. Using sharp paring knife, remove and discard tough skin, then chop into bite sized pieces. Transfer to deep serving dish with lid. Using 2 T olive oil in a large skillet with lid, saute diced shallots for 2-3 minutes over medium heat, then add minced garlic, mined ginger and chopped yellow pepper; continue to stir for another 1-2 minutes. Add a splash of water, reduce the heat and simmer covered for about 2 minutes, until the yellow pepper is bright and only lightly cooked. Transfer to serving dish with beets. Remove tough middle stems from kale, then slice into thin ribbons. Using the same large skillet, saute for 2 minutes over medium heat, then add a splash of water, reduce heat and simmer covered for about 2-3 minutes, until the kale is bright and lightly cooked, not mushy. Transfer to serving dish, mix all together well. Dress with juice of 1/2 freshly squeezed lemon. Will store well in an airtight container for a couple days. I served this with tofu baked in a spicy peanut sauce on a cold wintery day– bright and complementary flavors, and wonderfully warming. As I grew up, every dinner my mother prepared included a side serving of vegetables– and that was what we had to eat to get dessert. A small pile of mushy green peas, corn, or carrots from the freezer, string or baked beans from a can were the norm. When my mother and I were a little older, she would occasionally serve fresh asparagus (steamed to mushy) or an artichoke (served with mayonnaise, another horror). Given that my mother truly didn’t like vegetables, I’m sure now she never chose to serve brussels sprouts, which is probably good fortune… Sometime in my young adulthood I tried cooking brussels sprouts in my own kitchen, but my results weren’t great, so …. yea, brussels sprouts. Nobody I knew liked them. A generation later, one of my daughter’s friends self identified as a brussels sprouts lover. Really? “Just roast them in a little olive oil and maple syrup.” So I thought I’d give it another try. Here’s what I came up with– and enjoyed! Easy prep and satisfying. With the brussels, broccoli, and yellow pepper, this is very high in vitamins K & C. By including the tempeh, it becomes a great ‘one pot’ main dish that is great for leftovers to take on-the-go for lunch. Turn on oven to 375F. Remove ends of brussels sprouts and any yellowed or browned leaves, then cut in half or quarters depending upon size. 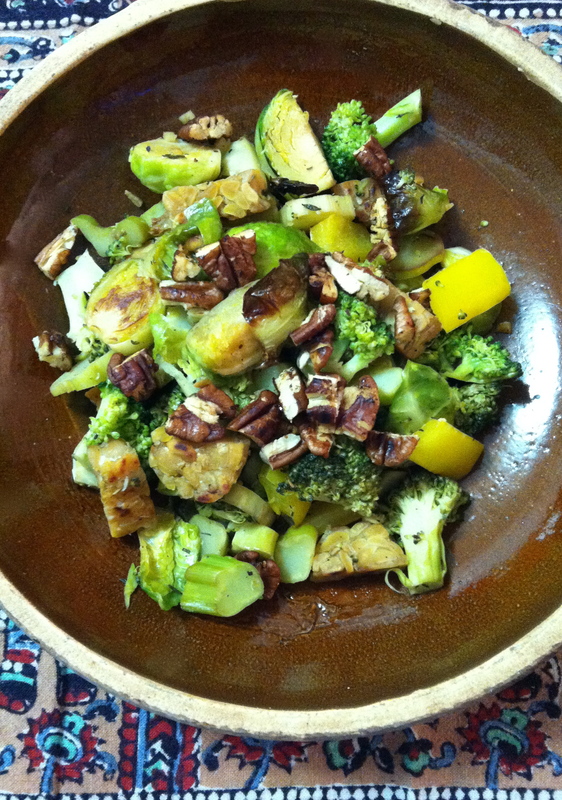 Pour 2T olive oil and 2T maple syrup into large frying pan, then add chopped brussels sprouts and stir to coat well. Wipe roasting pan with a little additional olive oil, then spread brussels sprouts onto roasting pan, also yellow pepper cut into 1/4 inch slices, and peeled garlic cloves. Roast for about 20 minutes, checking several ties to flip yellow peppers and stir brussels sprouts. The peppers will finish roasting first…roast brussels sprouts until lightly browned but still moist inside. When done roasting, transfer to casserole dish, and press the roasted garlic. While the brussels sprouts roast, use that same frying pan which is now coated in olive oil and maple syrup to toast the roughly chopped pecans over medium heat, stirring constantly. Toast until lightly browned and fragrant. Set pecans aside in serving dish. Using the same frying pan with an additional 2 T of olive oil, saute the chopped tempeh over medium heat, stirring for 3-4 minutes, then reducing the heat to medium low and covering to continue to cook. Check frequently every couple minutes to stir to prevent burning. Continue to cook until tempeh is nicely browned and cooked well inside without becoming dried out. Transfer to the casserole dish. While tempeh cooks, cut away the tough outer stem of the broccoli, then chop the broccoli stems into large bite sized pieces. Then transfer broccoli stems to that same frying pan to saute — add 2-3T of water as necessary. Add minced ginger and thyme, continue to stir for 2-3 minutes, then add 2-3 T of champagne vinegar to pan, stir, cover, reduce heat and simmer for another 2 minutes before adding chopped broccoli flowerettes. Cover and simmer for another 2-3 minutes, until broccoli is bright green and tender but still has plenty of body. Transfer to the casserole dish, stir all together well. Add ground black pepper to taste. Serve garnished with toasted pecans.